Technology is designed as a unique combination of high productivity and flexibility. Being a tight-web system, it has the unique capability to integrate seamlessly with high speed flexo and offset printing presses as well as with a wide range of pre- and post-processing and finishing equipment.Featuring Nipson Technology’s proprietary magnetography, cool xenon flash fusing, and variable speed control, it is ideally suited for high-quality, high-speed production-volume black & white variable data printing. in many ways, satisfying a broad range of workflow requirements.Our proprietary cool xenon flash fusing process fuses the toner without heating the substrate. The operator-controlled variable speed feature allows you to dynamically adjust the speed to ensure optimum print quality and productivity regardless of substrate type or finishing process. Furthermore, the Nipson Technology magnetic toner used in the VaryPRESS printers allows you to combine standard and MICR applications without the need for any additional costs or changes to the printers. 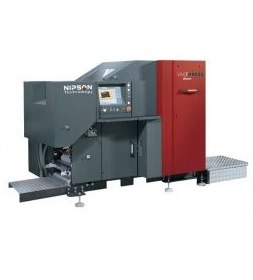 As a result, the Nipson VaryPRESS can be used to print a wide range of applications with a wide range of substrates from very lightweight paper (40 gsm) to heavy card stocks (240 gsm) as well as labels, foils, carbonless stocks, coated materials and plastic affixed cards. Substrate weights outside this range are possible subject to evaluation. SED Albility to print in duplex mode on a single printer. Note: all rated values are maximum achievable values. Actual values depend on the configuration, the environment and the application. Nipson Technology presses all use dry magnetographic toner. Engineered to perfection, this imaging process sets the industry standard for quality and reliability. Unlike liquid toner, dry toner can be used on virtually any type of substrate, without any pretreatment. Dry toner technology simply outperforms any other technology, combining superior image quality and process stability. Only dry toner technology can accurately produce minute details such as micro-text and guilloches in security features, serifs and fine lines in certain fonts, and hairlines. Because our black toner is magnetic, Nipson Technology presses are MICR-capable by default, enabling simultaneous printing of MICR characters and other variable data without the need of additional costs or changes to the printer. And our fluorescent toner further enhances your choice of security features. What is more, our proprietary mono-component toner not only guarantees cost-effective impeccable quality, it also contributes to a clean and environmentally-friendly operation by ensuring efficient de-inking process for recycled paper production.